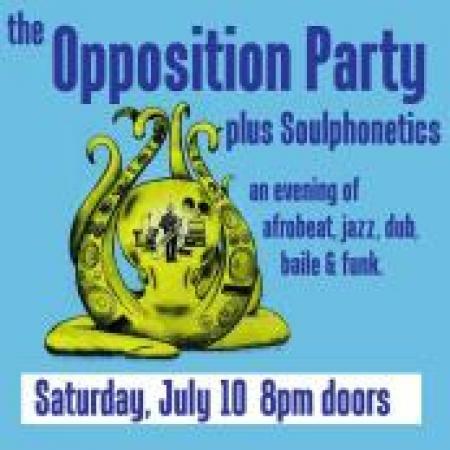 The Opposition Party is a collective of Chicago music professionals and educators, centered around performance of African music, and particularly the collaboration and cross-pollination across the Atlantic with Jamaican reggae and dub, and with American funk and jazz. Heavy grooves and high-energy rhythms come alive in a catalog that features music from artists like Ethiopiques, Fela Kuti, Tony Allen, Thomas Mapfumo, Jackie Mittoo, and OP originals that draw from all of it. Get ready to hear Nigerian Afrobeat to Zimbabwean Chimurenga to Jamaican Reggae and Dub, to Ethiopian Jazz and American Funk. It is all in the name of opening eyes and ears to grooves from around the world. OP originals draw from all these inspirations. In this band there are teachers, professional musicians, and activists. This project has a long history in Chicago, dedicated to music appreciation and preservation. This group is ready to launch their musical campaign in the community and spread cultural consciousness.